Embrace an alternative sightseeing experience of Cancun during a 20-minute scenic flight from Playa del Carmen. 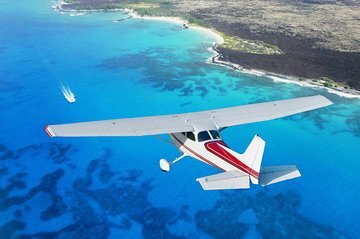 In a small group limited to 15, you’ll soar over the Caribbean Sea and admire the beauty of Isla Mujere’s and Cancun’s white-sand shores. Absorb aerial views of the lavish Cancun hotel zone and the Mayan jungle, and relish the convenience of hotel pickup and drop-off in Playa del Carmen. Following hotel pickup around 3:30pm, you’ll board an air-conditioned vehicle destined for Cancun Airport. Head straight for a plane that can accommodate a maximum of 15 passengers and feel your excitement height as the engines whir into life and you begin your ascent. The turquoise waters of the Caribbean Sea melt into the white-sand beaches of Cancun’s coastline, towered over by luxurious hotels and bordered by the Mayan jungle. Absorb aerial views of Punta Sam, Isla Mujeres, and Isla Holbox as the sun begins its majestic descent and another aerial perspective is revealed. Your experience concludes with hotel drop-off.